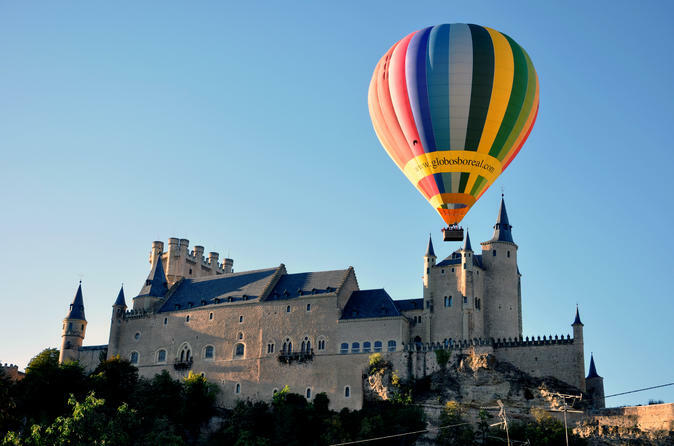 A balloon ride in Segovia is a unique and different flying experience: floating in the wind, seeing fascinating landscapes and feeling unforgettable sensations. Enjoy your flight with the first certified company in Spain for balloon rides, with expert professional balloonists as Javier Tarno, 6-time Spanish champion with more than 4,000 flight hours. Your expert pilot will help the ride be as smooth as possible through the area so you can admire the surrounding landscape. Our pilots have a huge experience in some of the most famous places in the world for balloon rides, such as Cappadocia (Turkey), Bagan (Myanmar) and Canada. At the end of the flight we will celebrate with a champagne toast and delicious breakfast. You can choose optional pick up from Madrid city hotels. Start your adventure at dawn, in the field close to the Motocross in front of the Hospital General (Segovia). If you are transferring from Madrid, you'll actually start 2-hours before dawn to allow plenty of time to arrive at the field. There, you and up to 10 other passengers will prepare to soar the skies in style. The total excursion time will be about 4-hours, including balloon inflation, take-off, flight, landing and a special ceremony afterwards. You'll soar over Segovia and its surrounding areas up to 1000 meters above the ground. Throughout the flight, the chase crew is in direct contact with the pilot and follows the balloon until it lands. Once you land, it's time for a celebration. You're invited to a traditional champagne toast to celebrate this unforgettable event, and then are given a certificate, breakfast and travel back to the launch field. During the activity we will make a video and photo report of this unforgettable experience. You can see the photos of previous flights looking for "Globos Boreal" on Facebook and the videos on our Youtube channel. For those awaiting transfer back to Madrid, you'll have an extra two hours in Segovia where you'll have free time to explore the city.